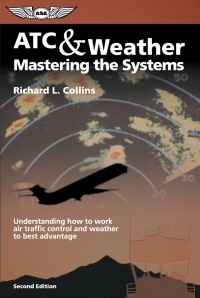 In this book, Richard Collins highlights and stresses the importance of negotiating the system of air traffic control and weather services to maximum advantage. The emphasis is on pilot judgment. A flight is affected by winds, storms are always a risk... and considering visibility, an area the regulations cover with a blanket rule that sets the VFR minimums in miles — this does not take into account differences in speed and a regulation's legality does not guarantee pilot and passenger safety. Yet Richard Collins demystifies the art of aviation, guiding the pilot through common misconceptions with solid advice and accurate examples for improvement. * VFR, IFR, MVFR, CVFR (continued VFR) — what kind of weather leads to the labels that flight decisions are based on? * How do you glean the necessary information during preflight, analyze the conditions experienced in flight, and calculate your own forecast based on new information? * When does it make sense to fly above the cloud deck, and when should you try to stay down below? In this revised Second Edition of his book, Collins teaches you how to use ATC to your benefit. The factors you need to consider when making these decisions are outlined, supplemented with examples from personal experience and accident reports. He explains the most frequent decisions pilots made when they were caught in weather, laying all the factors on the table so you have enough information to develop pilot and airplane limitations that make sense for you, and know when to ask ATC for help. But even with weather factors and services available en route, Collins is confident in his craft. He never lets his more than 40 years of flying relax his judgment.